NEW YORK (CelebrityAccess MediaWire) — More than two decades after canceling its national tour, the Metropolitan Opera will return to the Washington area on Dec. 30. Okay, it won't be quite the same. The singers, musicians and conductor will be performing Mozart's "Magic Flute" in New York on the stage of the Metropolitan Opera House at Lincoln Center. But it will be transmitted live at 1:30 p.m., with high-definition images and sound, via satellite to the AMC Hoffman 22 movie theater in Alexandria. More than 50 theaters across the U.S. plan to screen a live performance of the New York Metropolitan Opera's presentation of Mozart's The Magic Flute on December 30. The matinee performance, directed by Julie Taymore (The Lion King) and conducted by James Levine, is scheduled to begin at 1:30 p.m. ET and is the first of six such concerts due to be presented via satellite in high-definition and surround sound this season. Tickets have been priced at $18 for adults and $15 for children and are being sold at the theaters' box offices and via the opera company's website www.metoperafamily.org/metopera. This is one of a number of initiatives sponsored by the Met's new general manager, Peter Gelb. Others include deeply discounted orchestra seats for $20, available two hours before showtime on weekday nights. In September, a live performance of Puccini's "Madama Butterfly" was transmitted to Times Square. 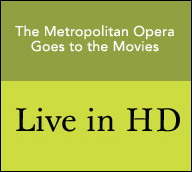 The Met's other "live in the movie theater" offerings continue on Jan. 6, when soprano Anna Netrebko and tenor Eric Cutler star in Bellini's "I Puritani." On Feb. 24, Renee Fleming, Dmitri Hvorostovsky and Ramon Vargas will appear in Tchaikovsky's "Eugene Onegin," under the direction of Valery Gergiev. Rossini's "Barber of Seville," with tenor Juan Diego Florez, mezzo-soprano Joyce DiDonato and baritone Peter Mattei, will be presented on March 24. The season will close on April 28 with a new production of Puccini's "Il Trittico," with a cast including sopranos Maria Guleghina and Barbara Frittoli, tenor Salvatore Licitra and baritones Juan Pons and Alessandro Corbelli. Levine will conduct.